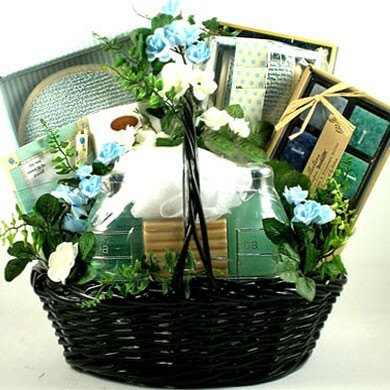 A unique spa basket tastefully designed especially for women. Indulgent chocolate and exotic bath and beauty products arrive arranged in a beautiful pamper spa basket. Indulge her with her own home spa treatment. This unique spa basket is tastefully designed especially for women. She will be so grateful as she enjoys the day pampering herself with the exotic bath and beauty products carefully selected and arranged in this beautiful pamper basket. We have also included a few of our favorite indulgent chocolate treats to truly spoil her! This exquisite home spa collection is trimmed to perfection with silk floral accents, ribbon and bows. It’s a wonderful gift that she will truly enjoy.